Focus on flying instead of noting down take-off and landing times while you are in the cockpit. 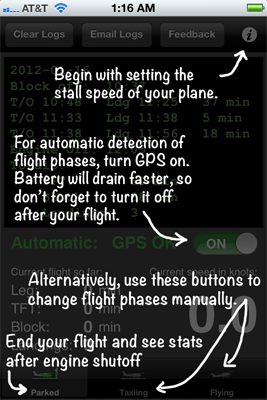 The Flight Time iPad and iPhone app is automatically logging block off, take-off and landing times using GPS. True flight time, block or hobbs time and number of landings. Carry over the recorded flight time into your good old logbook at the airport restaurant. 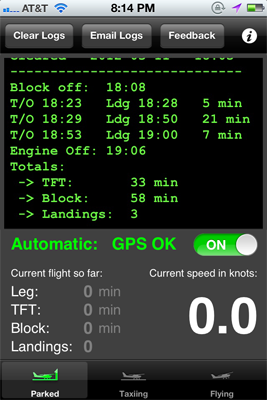 Glance at the app during flight to see elapsed total flight time, elapsed leg time and elapsed block time and even your ground speed. A flight instructor: "I like the fact that I can email the flight times to my student directly from the app." A student: " Before I used this app I often wasn't sure after a strenuous lesson how many landings we did. " Because 'Flight Time' uses the GPS/ground speed to decide whether you are flying or are on the ground, very slow flight during stall training can be detected as landings and very fast touch and goes can be missed. The flight time will still be correct, just check the landings if you do touch and goes, stall training or aerobatic flying.